This is a great improvement in AutoCAD 2013. Located in the new panel called “Model Viewports” on the View tab of the ribbon is the normal dropdown list but the improvement is that now you have a preview of how the viewports will be arranged. The New panel called : “Model Viewports” is great because it makes it clear that the viewport tools located in this panel apply to model space. 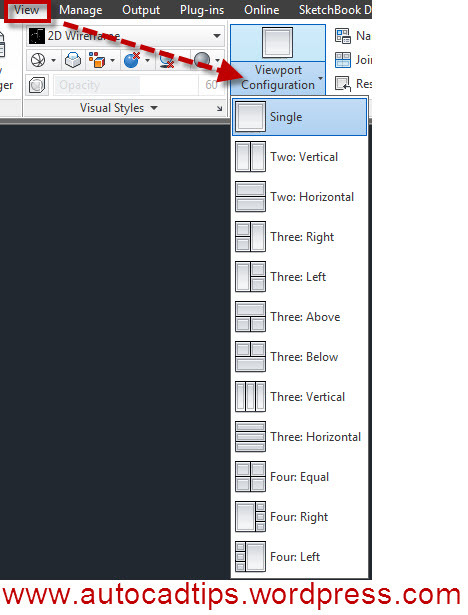 This entry was posted in AutoCAD 2013, BASICS, Customization, New In 2013, Settling In. Bookmark the permalink. both of these ways prompt me to popup, where i have options. I just dont know what happened to the simpler way to create a normal, viewport of the model space w/o asking me anything. I have made a post that hopefully helps you with your paper space needs. The simplest way to create a new viewport that I know of is using the command MV and then pick 2 points to make the viewport. Hi i have found the solution. They have moved the viewport tool to the new layout Tab.